Special thanks to Chuck "Wood Chuck" Bernard for the wood sculpture of my family's crest. You may notice the flag of the Acadian people is in the background. I am a descendant of the first settlers of the "New World". This region was called Arcadia, a land of bounty and prosperity. 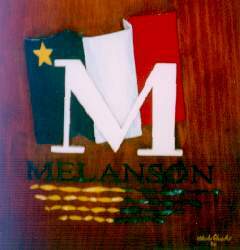 Since the dispersion of the Acadians in 1755 we have become one of the most widely spread peoples in the world. Here are a few links that you may find interesting. I decided to build my very own R2D2 replica and, yes, I really am just a big kid who makes money so that he can play with toys. Dale has been programming for years and built quite an impressive website to let programmers help programmers. Here is a website where you can find 3D software. I got into 3D a few years back and this proved to be a good place to find usefull information. This page has been visited times. But who's counting?